This genus offers the gardener 300 species to chose from; however many of the larger species are only suitable for the very large rock garden. Some species may seed around, and on a recent visit to a friend's garden that contained a major collection, I was told me that the removal of annually self -sown geranium seedlings was a major problem to contend with. Genanium farreri will never cause you any such problems, indeed if I ever find any self - sown seedlings I count myself most fortunate. 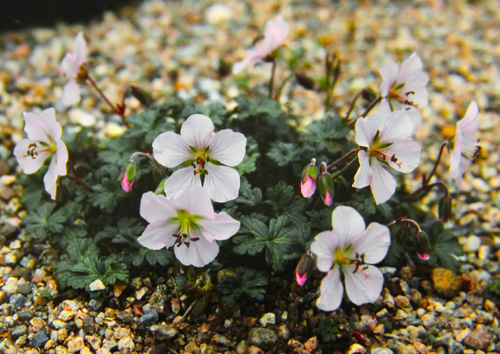 This diminutive Geranium hails from very high altitudes in China but adopts to our lowland gardens very well. The type plant is very neat and clump forming, usually no more than 10 to 15 cm in height. The flowers produced in early summer on red stalks are about 3cm in diameter, soft pink with deeper veining and the centre has a prominent tuft of black anthers . The AGS Encyclopaedia suggests that G. farreri is suitable for Alpine house culture; however I would not waste valuable space growing it under glass as it is very much at home in a trough, and recently I tried it in my crevice bed and find it seems to enjoy this garden habitat. Cuttings taken from just below soil - level in late spring root readily. However I usually rely on seed for new plants. 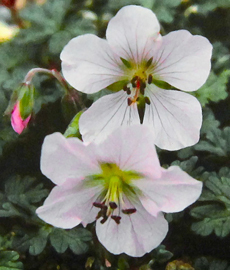 While this geranium is not as prodigal with its seed as other species, when available I sow the seed when ripe and germination occurs in late April, the seedlings are pricked out and are over wintered in a cold frame before planting in situ. Not appearing in nursery catalogues as often as it should, G farreri is usually listed on the AGS and other Seed Exchanges . I rate this superb little plant as one of Farrer’s best finds .